You should read enough of the materials presented in this section concerning the tradition of Confucianism in order to understand how this tradition displays the characteristics or elements that make a tradition one that would be termed a “religion. The tradition presented in the materials below is one of the world’s living religions. You reading should indicate why this is so. · THE PROBLEM FOR HUMANS: What is the principle problem for humans that they must learn to deal with and solve? · COMMUNITY AND ETHICS: What is the moral code as promulgated by the religion? What is the idea of community and how humans are to live with one another? The Philosopher Confucius 551-479 B.C. was a scholar and a teacher and a great thinker. He was of a tradition that studied the previous great works. He was one of the "literati". He studied and reflected on and taught the "literature" at the center of Chinese culture in its formative period. He consolidated the ancient texts and contributed commentaries upon them. He spoke about and answered questions about the most serious matters of concern to human beings. Confucianism is humanism, a philosophy or attitude that is concerned with human beings, their achievements and interests, rather than with the abstract beings and problems of theology. In Confucianism man is the center of the universe: man cannot live alone, but with other human beings. For human beings, the ultimate goal is individual happiness. The necessary condition to achieve happiness is through peace. To obtain peace, Confucius discovered human relations consisting of the five relationships which are based on love and duties. War has to be abolished; and the Great Unity of the world should be developed. The tradition which developed following his work and teachings came to bear his name. He did not express any desire to create a way of life but his influence was so great that it could not be ignored of forgotten. The tradition which developed is usually considered as a religion in as much as it does exhibit the characteristics of a religion, although there are many raised in the West who have doubts about calling Confucianism a "religion" because t does not have a deity or deities that feature prominently in the tradition. On the other hand it does convey clearly what matters most and and it does hold the focus on humanity and basic human virtues as being of "ultimate concern" and thus has an idea or concept of an Absolute which serves as bedrock belief for an entire way of life. Confucianism, major system of thought in China, developed from the teachings of Confucius and his disciples, and concerned with the principles of good conduct, practical wisdom, and proper social relationships. Confucianism has influenced the Chinese attitude toward life, set the patterns of living and standards of social value, and provided the background for Chinese political theories and institutions. It has spread from China to Korea, Japan, and Vietnam and has aroused interest among Western scholars. Although Confucianism became the official ideology of the Chinese state, it has never existed as an established religion with a church and priesthood. Chinese scholars honored Confucius as a great teacher and sage but did not worship him as a personal god. Nor did Confucius himself ever claim divinity. Unlike Christian churches, the temples built to Confucius were not places in which organized community groups gathered to worship, but public edifices designed for annual ceremonies, especially on the philosopher's birthday. Several attempts to deify Confucius and to proselyte Confucianism failed because of the essentially secular nature of the philosophy. The principles of Confucianism are contained in the nine ancient Chinese works handed down by Confucius and his followers, who lived in an age of great philosophic activity. These writings can be divided into two groups: the Five Classics and the Four Books. The Wu Ching (Five Classics), which originated before the time of Confucius, consist of the I Ching (Book of Changes), Shu Ching (Book of History), Shih Ching (Book of Poetry), Li Chi (Book of Rites), and Ch'un Ch'iu (Spring and Autumn Annals). The I Ching is a manual of divination probably compiled before the 11th century BC; its supplementary philosophical portion, contained in a series of appendixes, may have been written later by Confucius and his disciples. The Shu Ching is a collection of ancient historical documents, and the Shih Ching, an anthology of ancient poems. The Li Chi deals with the principles of conduct, including those for public and private ceremonies; it was destroyed in the 3rd century BC, but presumably much of its material was preserved in a later compilation, the Record of Rites. The Ch'un Ch'iu, the only work reputedly compiled by Confucius himself, is a chronicle of major historical events in feudal China from the 8th century BC to Confucius's death early in the 5th century BC. The Shih Shu (Four Books), compilations of the sayings of Confucius and Mencius and of commentaries by followers on their teachings, are the Lun Yü (Analects), a collection of maxims by Confucius that form the basis of his moral and political philosophy; Ta Hsüeh (The Great Learning) and Chung Yung (The Doctrine of the Mean), containing some of Confucius's philosophical utterances arranged systematically with comments and expositions by his disciples; and the Mencius (Book of Mencius), containing the teachings of one of Confucius's great followers. The keynote of Confucian ethics is jen, variously translated as "love," "goodness," "humanity," and "human-heartedness." Jen is a supreme virtue representing human qualities at their best. In human relations, construed as those between one person and another, jen is manifested in chung, or faithfulness to oneself and others, and shu, or altruism, best expressed in the Confucian golden rule, "Do not do to others what you do not want done to yourself." Other important Confucian virtues include righteousness, propriety, integrity, and filial piety. One who possesses all these virtues becomes a chün-tzu (perfect gentleman). Politically, Confucius advocated a paternalistic government in which the sovereign is benevolent and honorable and the subjects are respectful and obedient. The ruler should cultivate moral perfection in order to set a good example to the people. In education Confucius upheld the theory, remarkable for the feudal period in which he lived, that "in education, there is no class distinction." After the death of Confucius two major schools of Confucian thought emerged: one was represented by Mencius, the other by Hsün-tzu (Hsün K'uang, 300?-235? BC). 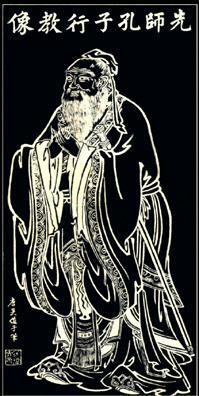 Mencius continued the ethical teachings of Confucius by stressing the innate goodness of human nature. He believed, however, that original human goodness can become depraved through one's own destructive effort or through contact with an evil environment. The problem of moral cultivation is therefore to preserve or at least to restore the goodness that is one's birthright. In political thought, Mencius is sometimes considered one of the early advocates of democracy, for he advanced the idea of the people's supremacy in the state. In opposition to Mencius, Hsün-tzu contended that a person is born with an evil nature but that it can be regenerated through moral education. He believed that desires should be guided and restrained by the rules of propriety and that character should be molded by an orderly observance of rites and by the practice of music. This code serves as a powerful influence on character by properly directing emotions and by providing inner harmony. Hsün-tzu was the main exponent of ritualism in Confucianism. 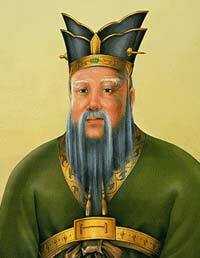 After a brief period of eclipse in the 3rd century BC, Confucianism was revived during the Han dynasty (206 BC-AD 220). The Confucian works, copies of which had been destroyed in the preceding period, were restored to favor, canonized, and taught by learned scholars in national academies. The works also formed the basis of later civil service examinations; candidates for responsible government positions received their appointments on the strength of their knowledge of classic literature. As a result, Confucianism secured a firm hold on Chinese intellectual and political life. The success of Han Confucianism was attributable to Tung Chung-shu, who first recommended a system of education built upon the teachings of Confucius. Tung Chung-shu believed in a close correspondence between human beings and nature; thus a person's deeds, especially those of the sovereign, are often responsible for unusual phenomena in nature. Because of the sovereign's authority, he or she is to blame for such phenomena as fire, flood, earthquake, and eclipse. Because these ill omens can descend on earth as a warning to humanity that all is not well in this world, the fear of heavenly punishment proves useful as a curb to the monarch's absolute power. In the political chaos that followed the fall of the Han dynasty, Confucianism was overshadowed by the rival philosophies of Taoism and Buddhism, and the philosophy suffered a temporary setback. Nevertheless, the Confucian Classics continued to be the chief source of learning for scholars, and with the restoration of peace and prosperity in the Tang dynasty (618-907), the spread of Confucianism was encouraged. The monopoly of learning by Confucian scholars once again ensured them the highest bureaucratic positions. Confucianism returned as an orthodox state teaching. The intellectual activities of the Song (Sung) dynasty (960-1279) gave rise to a new system of Confucian thought based on a mixture of Buddhist and Taoist elements; the new school of Confucianism was known as Neo-Confucianism. The scholars who evolved this intellectual system were themselves well versed in the other two philosophies. Although primarily teachers of ethics, they were also interested in the theories of the universe and the origin of human nature. Neo-Confucianism branched out into two schools of philosophy. 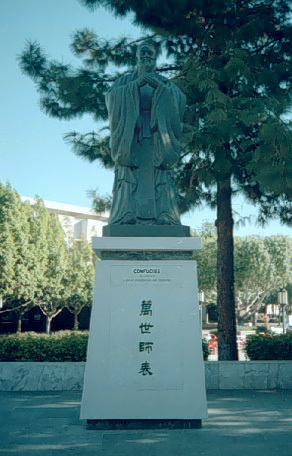 The foremost exponent of one school was Chu Hsi, an eminent thinker second only to Confucius and Mencius in prestige, who established a new philosophical foundation for the teachings of Confucianism by organizing scholarly opinion into a cohesive system. According to the Neo-Confucianist system Chu Hsi represented, all objects in nature are composed of two inherent forces: li, an immaterial universal principle or law; and ch'i, the substance of which all material things are made. Whereas ch'i may change and dissolve, li, the underlying law of the myriad things, remains constant and indestructible. Chu Hsi further identifies the li in humankind with human nature, which is essentially the same for all people. The phenomenon of particular differences can be attributed to the varying proportions and densities of the ch'i found among individuals. Thus, those who receive a ch'i that is turbid will find their original nature obscured and should cleanse their nature to restore its purity. Purity can be achieved by extending one's knowledge of the li in each individual object. When, after much sustained effort, one has investigated and comprehended the universal li or natural law inherent in all animate and inanimate objects, one becomes a sage. Opposed to the li (law) school is the hsin (mind) school of Neo-Confucianism. The chief exponent of the hsin school was Wang Yang-ming, who taught the unity of knowledge and practice. His major proposition was that "apart from the mind, neither law nor object" exists. In the mind, he asserted, are embodied all the laws of nature, and nothing exists without the mind. One's supreme effort should be to develop "the intuitive knowledge" of the mind, not through the study or investigation of natural law, but through intense thought and calm meditation. During the Qing (Ch’ing) dynasty (1644-1911) there was a strong reaction to both the li and hsin schools of Neo-Confucian thought. Qing scholars advocated a return to the earlier and supposedly more authentic Confucianism of the Han period, when it was still unadulterated by Buddhist and Taoist ideas. They developed textual criticism of the Confucian Classics based on scientific methodology, using philology, history, and archaeology to reinforce their scholarship. In addition, scholars such as Tai Chen introduced an empiricist point of view into Confucian philosophy. Toward the end of the 19th century the reaction against Neo-Confucian metaphysics took a different turn. Instead of confining themselves to textual studies, Confucian scholars took an active interest in politics and formulated reform programs based on Confucian doctrine. K'ang Yu-wei, a leader of the Confucian reform movement, made an attempt to exalt the philosophy as a national religion. Because of foreign threats to China and the urgent demand for drastic political measures, the reform movements failed; in the intellectual confusion that followed the Chinese revolution of 1911, Confucianism was branded as decadent and reactionary. With the collapse of the monarchy and the traditional family structure, from which much of its strength and support was derived, Confucianism lost its hold on the nation. In the past, it often had managed to weather adversities and to emerge with renewed vigor, but during this period of unprecedented social upheavals it lost its previous ability to adapt to changing circumstances. In the view of some scholars, Confucius will be revered in the future as China's greatest teacher; Confucian classics will be studied, and Confucian virtues, embodied for countless generations in the familiar sayings and common-sense wisdom of the Chinese people, will remain the cornerstone of ethics. It is doubtful, however, that Confucianism ever again will play the dominant role in Chinese political life and institutions that it did in past centuries. The Chinese Communist victory of 1949 underlined the uncertain future of Confucianism. Many Confucian-based traditions were put aside. The family system, for example, much revered in the past as a central Confucian institution, was deemphasized. Few Confucian classics were published, and official campaigns against Confucianism were organized in the late 1960s and early '70s.